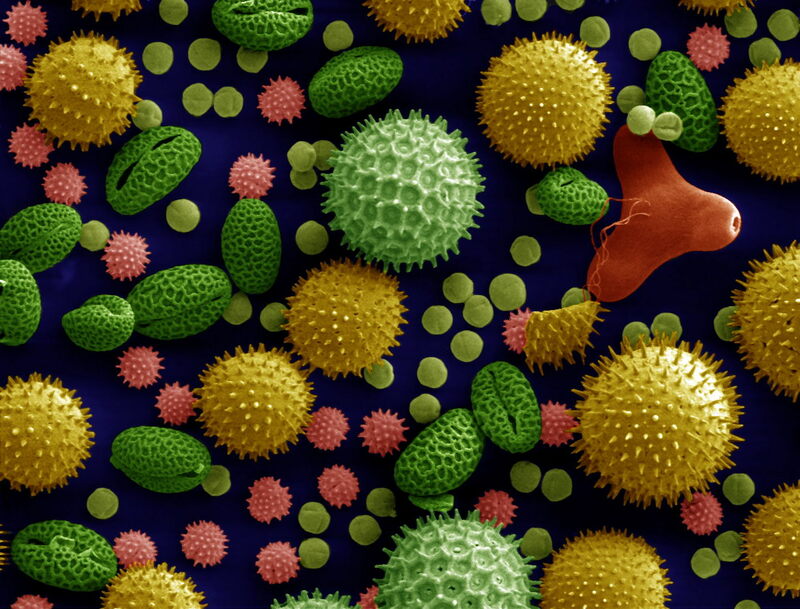 Horror, thy name is pollen. Ragweed is very common in NJ, as are Goldenrod and Hemlock. Since I don’t need to kill any philosophers, and the goldenrod doesn’t offend me, I’ll focus on the ragweed. All three plants line our highways and in the rural areas where we lived, a drive down the back roads would reveal miles of farms and fields filled with goldenrod. Next to the pretty goldenrod, filthy ragweed grows. From the moment the ugly little plants would bloom, the horror would begin. Suddenly my airway would constrict, my nose would run, my throat, ears, and eyes would swell and itch, and the sneezing would continue unabated until early October when the pollen was finally consumed by magic tree frogs or whatever actually happened to all the vile stuff in the air. Unfortunately, after the pollen was gone, my body would still suffer. Since my overwhelmed sinuses had been pouring noxious snot into my lungs 24 hours a day for two weeks, my lungs would invariably resort to some sort of respiratory infection that would torment me for another couple of weeks. I love pollen. I was 35 when I finally figured out what was going on as opposed to just thinking I was sick all the time. It took a doctor who finally looked at me and told me that it was a simple ragweed allergy and not some sort of recurring plague that was slowly killing me. I could design a multi-million world-wide computer network that converges voice, video, and data, but I couldn’t figure out that I have the most common allergy on the east coast at the same time every year. I have often considered myself to be the stupidest smart guy I know. I’ve learned to get the proper, though mostly useless, medications before my birthday in early September. If I waited until the symptoms hit in full force the pharmacies would look like a gun store that had been pillaged after a zombie invasion. One of the downsides of this yearly ordeal was the fact that when I was in full blown hay-fever misery, my other mild allergies were significantly magnified. It was during these two weeks every year that I would be reminded that I am also allergic to dust mites, cats, and perhaps most importantly, dogs. My allergy to dogs is slight, and it was only a concern if I sat on a cloth couch where a dog had been allowed to lie. Similarly, lying on the carpet in our house was a bad idea for me. Luckily, my aging bones rebelled even then against rising from the carpet so my face was rarely close to it, though I did find that petting my dogs for any length of time would cause my skin to itch. Worse, the copious drool so closely associated with Newfoundland dogs also seemed to be an allergen for me. I had long ago learned to wash my hands after petting the dogs, so it wasn’t like I needed to carry an epi-pen. Except, that is, when the ragweed would bloom. I’m not normally what I’d call a happy person, but for these two weeks in September I would be extra grumpy. When my mood turned to grumpiness, Cozy would always be there to offer me comfort and solace, which was really quite touching and wonderful. Sadly, Cozy’s proximity would become noxious in direct correlation to the pollen count announced for that day. I loved my Cozy, but when I was struggling to breathe while wanting to scratch my eyes out, a drooling Newfy head was the last thing I wanted in my lap. Cozy was a smart girl, but this was beyond her understanding. She just wanted to help her Daddy. Finally, I put up a baby gate on the office door so that the dogs couldn’t get in. Cozy would stand at the gate and look at me with her big sad eyes that let me know with a snort that I was a jerk, but my misery was such that I just didn’t care. I had banished my Cozy from the office where I would spend my time locked up with the air conditioner on, sneezing the hours away while Cozy lay curled up outside with her body pushed up against the gate. She had accepted her fate, but she wasn’t happy about it.